The previous day saw the start to planting Persimmon trees from seed. Nature had stratified and scarified the persimmon seeds while the Gleditsia triacanthos seeds experienced only the former. Many sources say the easiest way to scarify honey locusts seeds is to boil water at a 4:1 volume ratio to your seeds, let it cool to 190 degrees fahrenheit, then soak the seeds for half of a day. Many sources say the most effective way to scarify seeds is to nick their protective coat with a file or knife which seemed tedious so the first option was chosen. Well, after a 20 hour soak only 9 of the 80-100 seeds swelled. It is noted that the seeds will swell to 3x their size, but any swelling indicates the protective seed coating has been successfully breached. I’ll save the pictures for when more seeds are ready to be planted. To end on a positive note, I tossed some apple seeds into leftover cells in the starter tray! 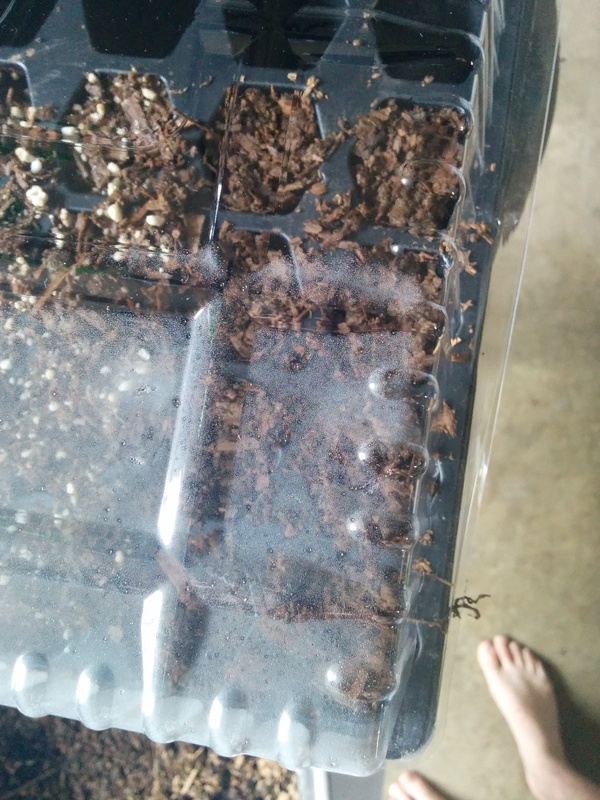 The cells with perlite were leftover persimmon seeds planted in leftover soil. Misfits and otherwise passed over seeds get a second chance in this tray! I hope more of the seeds will soon scarify (new word for me and I hope I’ve used to right).